Home » Educational Articles » Help! My Teenager is Out of Control! Does your teenager seem to be out of control lately? Many of the families we serve wonder if their teen’s current behavior is normal or healthy for a teenager. The changes some families observe in their child occur seemingly overnight, while other families see a gradual decline every day, and, in many cases, families have been struggling with their child for as long as they can remember. Parents in the middle of the constantly-swirling drama and worry of raising a teenager can easily become confused about what kind of behavior is “normal” or “healthy” for their own teenager and what is not. What is “Normal” or “Healthy” Behavior for a Teenager? Teenagers are in a stage of life where they are learning how to cope with our crazy world, their bodies, and their minds, and they are often having to take in way more than they can handle at once. They are learning how to look ahead and make wise decisions, how to establish personal boundaries, how to deal with disappointment, how to cope with uncertainty, how to handle and understand failure, how to manage their bodies and deal with their physical “passions” in a non-destructive way, and how to properly interact with other people who may or may not be healthy themselves, among many other incredibly consequential life lessons. Unfortunately, we cannot teach these things to our children by telling them “how it is”. We often forget that they are learning these things without any prior knowledge or experience. They will need to gain the necessary skills much like one learns a trade, such as plumbing or welding, and integrate these skills into their daily lives. We can certainly guide our teenagers in the right direction, but the choice in the end is theirs. A healthy teenager will often do foolish things or try new experiences without thought to the consequences. It’s normal for teenagers to make mistakes, and hopefully, to eventually learn from their experiences. It’s part of growing up. The ideal is that teens learn from their mistakes and modify their mindset, and by extension their behavior. As we all know, the necessary changes don’t always happen the first time! The key to grasping the current health of your teenager starts with asking yourself whether or not their behaviors are persistently self-destructive, either in the short term or in the long term. Furthermore, are those self-destructive behaviors negatively affecting others — their friends, siblings, family, teachers, or authorities? These two questions should give you a pretty good barometer for how bad things really are. These are probably the most obvious of all of the self-destructive behaviors. 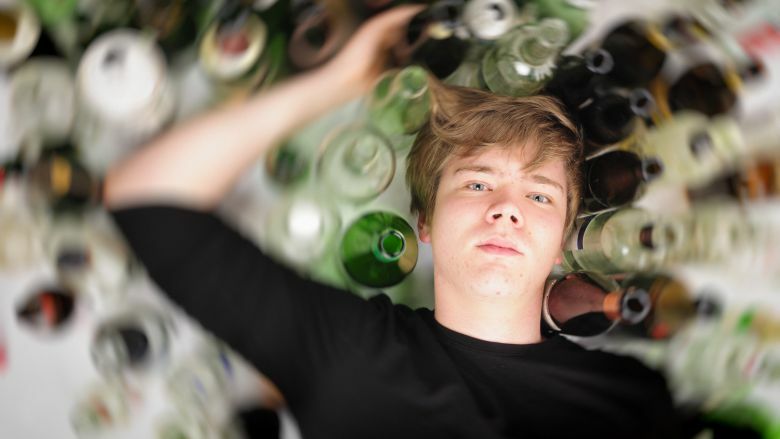 Substance abuse or alcohol abuse to the point of damage or near damage to body or mind is extremely self-destructive. Those who can’t get access to narcotics, pain killers, or alcohol will turn to huffing paint, glue or household cleaners. Teens will often steal prescription drugs directly from your medicine cabinet (or their friends) — anything for a temporary release from reality. We’re also of the opinion that marijuana (or “pot”) is definitely one of these coping substances, often used by teenagers to escape high levels of anxiety. These coping behaviors help teenagers to temporarily escape their painful, often unidentified thoughts, emotions, or anxiety, only to come out on the other side feeling worse, and even less capable of dealing with the hard things they need to grapple with. Promiscuity involves seeking sexual encounters or offering sexual favors to anyone who is willing to participate. Parents often tell us stories of teens who have pursued extremely risky sexual encounters with others of the opposite or same gender, with whom their teens have had no previous personal acquaintance whatsoever. Some pursue inappropriate encounters with family members. These behaviors are seeking a level of connection and intimacy that these teenagers cannot seem to fulfill in normal day-to-day relationships. There is also an aspect of control in these encounters that allows teenagers to feel like they have power over and can escape emotional vulnerability. However, this behavior can become dangerous very quickly, even deadly. The behavior can also affect other people negatively, and it often destroys lives. Some teens may seek to control the shape of their bodies as a shaky and often dangerous substitute for controlling the feeling that we as humans are entirely uncertain about how others perceive us. Unfortunately, these perceptions are completely out of our control and can never be controlled. These teens feel and know that something is wrong, and something must change, but they do not know what it is that must change. Instead of looking inwardly at their thought life and how they view their self, they look outwardly and think, “If I can just change my body, then I will feel better about myself, people will love me, and there will be much less uncertainty about how people perceive me.” Anorexia and bulimia are common among teenage girls, although boys often struggle with these as well. Both are extremely self-destructive behaviors. Once a teen starts down this path, it quickly becomes ingrained into the 24-hour cycle of their body and mind. The behavior can become very difficult to break, and eventually will become dangerous to both their physical and mental health. Teens who cut or self-harm seek to subdue and control the overwhelming anxiety they may experience in certain situations that cause uncertainty, conflict, or fear. Believe it or not, cutting can have a temporary soothing affect for teens who are experiencing strong, often unidentified emotions, although the effect is only temporary and diminishes over time. Teens cut because it “works”, and many struggle with the behavior well into their adult lives. While most teens who cut are not suicidal (however if their depression gets progressively worse and remains unaddressed for an extended period of time, this can change very quickly), the reality is that they are harming their bodies and are self-destructing, something that no healthy individual does on their own. Cutting is also usually an indicator of other deep-rooted issues that may need to be addressed. Teenagers who have discovered a way to cope with their emotional, mental, or physical pain that works for them, at least temporarily, will do absolutely anything in order to ensure they can continue to do so, regardless of the consequences. There are no limits here. These “coping mechanisms” produce secondary behaviors — self-isolation or withdrawal, manipulation, sneaking out, stealing your car, blatant lying, obsessive need for control, cheating, running away, defiance, anger, disregard for the law and even violence. When parents begin to see problems, they usually clamp down and put boundaries and rules in place to prevent their children from participating in these behaviors. This often escalates the behaviors of teens that have been involved in their coping mechanism for awhile. They may feel an overwhelming need to have access to their coping mechanisms, which can result in out of control behaviors, anger, lying, blatant disrespect, and an extremely fearful home environment — which has probably landed you here on our web site. Have You Reached the End of Your Ability to Help Your Out of Control Teenager at Home? It’s time to start asking yourself if your family is equipped to help your out of control teenager at home any longer. We talk to so many parents every day who are great parents watching their child spiral out of control, and who are completely lost as to how help their teenager. Thankfully, there is help and hope. Therapeutic boarding schools, residential treatment centers, and wilderness therapy programs are built specifically to help families get their out of control teenager back to a healthy mindset. We work with incredible 12-18 month therapeutic boarding school programs, residential treatment centers, and short-term 60-90 day intensive wilderness programs all over the country, run by expert staff who can help your teenager and your family. The cost in time and money will absolutely be a sacrifice, but you need to ask yourself, “If my son or daughter were to die tomorrow, what will I wish I had done?” Unfortunately, over the years we have heard several heartbreaking stories where parents did not act in time to help their teen. Always remember, it’s important to ask the right questions before you place your out of control teenager in a therapeutic boarding school, residential treatment center, or wilderness therapy program. If you feel like you don’t know the right questions to ask, we can help you ask the right questions and pursue the best options for your teen, or find someone who knows the right questions and listen to what they have to say — it may just save your teen’s life. DISCLAIMER: This article is not intended as medical advice and should not be used as a basis for diagnosis. We are in no way a substitute for a licensed doctor or therapist. For medical diagnoses, please consult with a psychiatrist and have your child evaluated. If your child is presently suicidal or threatening physical harm to their self or others, call 911 immediately. What Value Does The Envoy Group Offer to Families?